Infrared heat is the light produced by the sun. This is the heat you feel penetrate your skin when you stand in the sun and miss when you walk into the shade. Infrared energy is also given off as body heat. 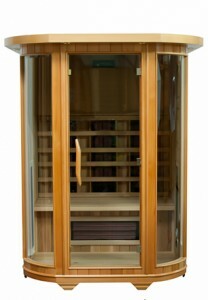 Many runners place a demand on their cardiovascular systems not to build muscles but to benefit from cardiovascular conditioning, regular use of a sauna may impart similar stress on the cardiovascular system and be as effective as other means of cardiovascular conditioning and burning of calories and regular exercise with many other benefits. Infrared heat emitted with theramitters in the 7-14 micron range with a peak of 9.4 microns, which is the same as the human body making it easier to absorb. Easier absorption also means that the infrared heat penetrates deeper into the body tissues than traditional hot air and steam saunas-up to an inch-and-a-half, and the body is better able absorb the beneficial infrared in a shorter period of time as well as increased peripheral dilation which increases/improves circulation and helps everything function properly.